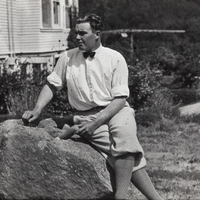 Subject is exactly "Native Americans"
Elvis Frapwell sitting on Indian mortar stone. 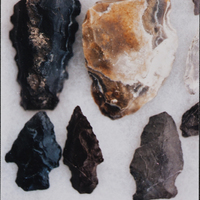 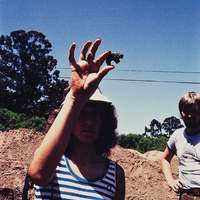 Artifacts found at the site of Scotts Valley City Hall, 1982-1987; the dig project was conducted by Dr. Robert Cartier, archaeologist. 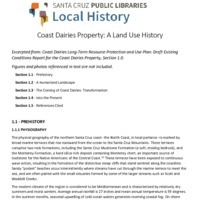 Source: Coast Dairies Long-Term Resource Protection and Use Plan: Draft Existing Conditions Report for the Coast Dairies Property, Section 1.0.San Francisco, CA: Environmental Science Associates, 2001. 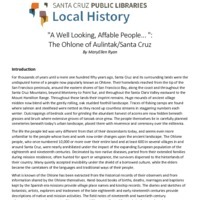 Source: This is an excerpt, originally called "Ethnographic Background", from a 1991 report titled, The Santa's Village Site CA-SCr=239. 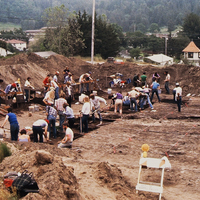 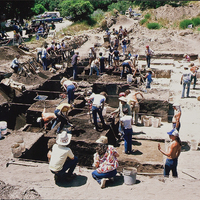 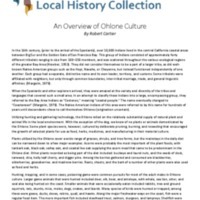 This report was the result of an archaeological dig by the Field Methods in Archaeology Class of De Anza College, which was lead by Robert Cartier. 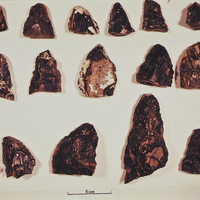 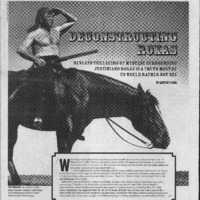 The report was prepared by Robert Cartier with Laurie Crane, Cynthia James, Jon Reddington, and Allika Ruby.